Susan Blackmon - Author - Susan Blackmon - Author of Key West historical novels. Generational stories drawn from the vibrant history of Key West. A sweeping saga of love and war in the pioneer days of Florida. Theodore Whitmore doesn't realize how badly he needs a change in his life. Recently widowed, he is a writer for a New York paper struggling with his grief and the care of his young son. His boss, Bob Jenkins, more friend than employer, offers an assignment he can’t resist in the hopes of helping Theodore cope with his melancholy. What starts as a summer sabbatical in Key West, Florida turns into an extended adventure embroiling Theodore in the Second Seminole War. Can peace be found for the country and the turbulence in his heart? Love Again is set in a time when our country is young, arrogant and expanding, but a political storm is brewing over slavery. In the midst of this heyday with its dark undercurrents, Theodore finds his loyalties tested. His patriotism collides with the injustice perpetrated on the indigenous people and their brutal retaliation against the pioneer settlers of Florida. Can Theodore remain true to his beliefs and avoid taking sides in the midst of the swirling conflict? Follow links to purchase book. Salvaged Love is the story of a young girl's journey into womanhood and her need to carve a place for herself in the small island community and in the heart of her husband. 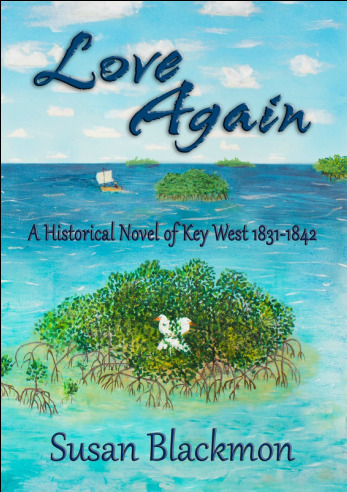 Set in 1828 at the cusp of Key West's rise to wealth from ship salvaging, the story blends fact and fiction to entertain and highlight the fascinating history of Key West, Florida. Nineteen year old Abigail Bennington eagerly accepts her father's invitation to sail to the Caribbean in a desperate need to escape her current situation. Expecting a six month holiday, plans go awry when they become stranded in Key West, a newly settled island at the entrance of the Gulf of Mexico, surrounded by treacherous reef and inhabited mostly by men. Abby becomes enchanted with the tiny island and its residents until circumstances force her father to insist she marry. Now locked in matrimony, can the young couple's burgeoning love survive resentment and isolation?